Sciency Thoughts: Magnitude 6.6 Earthquake and series of aftershocks hit South Island, New Zealand. Magnitude 6.6 Earthquake and series of aftershocks hit South Island, New Zealand. A Magnitude 6.6 Earthquake at a depth of 8 km hit New Zealand's South Island, close to Clifford Bay on the Cook Straight, slightly after 2.30 pm local time (slightly after 2.30 am GMT) on Friday 16 August 2013, according to the GeoNet project, which monitors quakes in New Zealand. This has been followed by a number of aftershocks, with at least 10 quakes in excess of Magnitude 5 beneath northeast South Island or the Cook Straight since the initial event. There are no reports of any fatalities, but buildings have been damaged on both of New Zealand's main islands, a number of roads have been closed and several people have been treated for minor injuries. 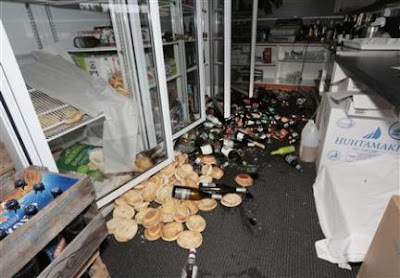 Damage in a shop in Seddon, South Island, following the 16 August 2013 quakes. Anthony Phelps/Reuters. New Zealand is located on the boundary beneath the Australian and Pacific Plates. Beneath the islands the Pacific Plate is being subducted beneath the Australian Plate. This causes a great deal of friction which causes Earthquakes where the boundary between the two plates is close to the surface; this is to the east of North Island, but onshore on South Island, where it can lead to strong Earthquakes such as the ones felt in Christchurch recently. Technically such quakes also occur where the plate margin is deeper, but these are felt less strongly as the rocks between the boundary and the surface absorb much of the energy, making strong tremors much less frequent on North Island. As the Pacific Plate sinks deeper into the Earth it is partially melted by the friction and the heat of the planet's interior. Some of the melted material then rises through the overlying Australian Plate, fueling the volcanoes of New Zealand. 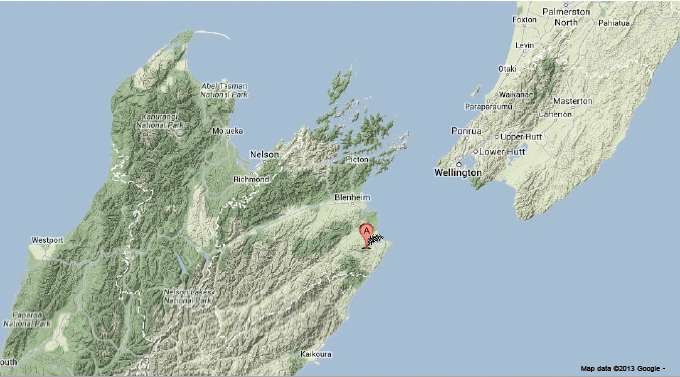 The approximate location of the 16 August 2013 New Zealand Earthquake. Google Maps. The Cook Straight area has been shaken by a series of quakes since a Magnitude 6.5 Earthquake took place on 21 July 2013. Witness reports of Earthquakes can help scientists to understand these events, and the underlying geologic processes that cause them. If you felt either of these quakes then you can report it to the GeoNet here. 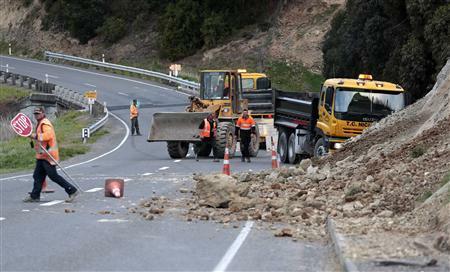 A landslip on the outskirts of Seddon, South Island, following the 16 August 2013 quakes. Anthony Phelps/Reuters. See also New Zealand rattled by Earthquakes, Pumice raft linked to Havre Seamount, not Monowai, Pumice raft suggests eruption from Mount Monowai, Volcanic activity on White Island, New Zealand and Eruption on Mount Tongariro. Oil spill in the Gulf of Khambhat. Drilling rig burning in southern Texas. Five injured in Uttarakhand landslide. Six children dead in Honduran landslide. Magnitude 4.3 Earthquake in northwest Turkey. The biodiversity of Beaded Lizards. Homes destroyed in Sichuan Earthquake. Magnitude 1.3 Earthquake in mid-Wales. Worker killed by landslide in Vietnam. Earthquakes off the Lancashire coast. Magnitude 4.6 Earthquake in northern Tanzania. A Pliosaur from the Jurassic Coast of Dorset. Magnitude 6.2 Earthquake in southern Mexico. Magnitude 3.6 Earthquake in Washington State. Gas rig on fire in Caspian Sea. Magnitude 5.5 Earthquake in northeast Chile. British MP arrested at Sussex anti-fracking demo. Two new species of Dustywing from Tertiary amber. Magnitude 4.1 Earthquake in northeast Turkey. Three people killed in Guangxi landslides. Steam explosions on Mount Kverkfjöll. Three killed in Java landslide. Magnitude 4.3 Earthquake on eastern Sicily. Worker killed at Western Australia ore mine. Typhoon Utor hits south China. Oil spill on the Oklahoma River. Magnitude 3.9 Earthquake in Tuscany. A new species of Marsh Rove Beetle from Japan. Fuel pipeline explodes in western Illinois. At least seven dead following Nepal Landslides. Swedish miners rescued from underground fire. The diet of the Langebaanweg Hyaenids. Punctatus emeiensis, not a Cnidarian after all? Six people killed by eruption on Mount Rokatenda. Four new species of Wasp from Cretaceous amber. Magnitude 3.7 Earthquake in the Tyrol, Austria. A new species of Scorpion from Ecuador. Magnitude 3.4 Earthquake in New South Wales. Earthquake of the north coast of Morocco. Four new species of Bryozoans from New Zealand.